Ben Connors from McClatchy’s New Ventures Lab shares how (and why) they’ve built its first augmented reality app, Actual Reality! This article originally appeared on McClatchy NVL’s Medium account and has been published here with their permission. That 162-year-old charge drives the work we do at McClatchy New Ventures Lab today. It calls us back to a time before video, audio, webpages, color printing or even photography were part of our newsrooms or products. And it pushes us forward, demanding that we continue to be prepared for what news will look like in the future. Today we’re excited to share one potential future with stakeholders like you, so that you can give us feedback and help us build the next new medium into our products. 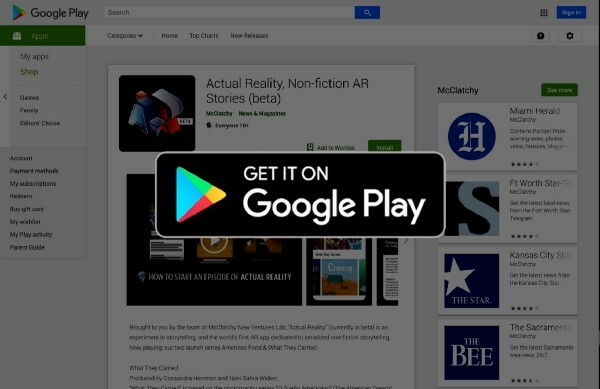 McClatchy New Ventures Lab is proud to publicly release a beta version of our experimental AR app Actual Reality. And along with it, the premiere of two nonfiction immersive series created by our first cohort of Storytellers in Residence: “What They Carried” an immersive story about the belongings people choose to carry when they cross the Mexico-US border and “American Food” an AR foodie tour of US ethnic enclaves. 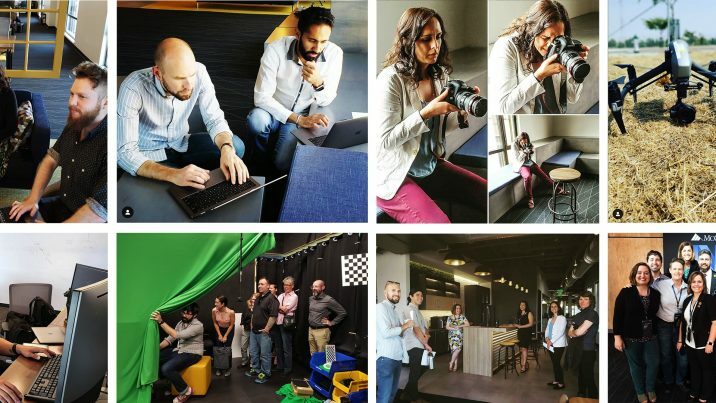 The team at McClatchy New Ventures Lab works across a range of emerging technologies, playing a role in everything from changes in the way video is created and consumed to the way voice assistants are changing search habits. The rate of transformation across all these communication technologies is remarkable. However, we believe that in the near future, the surge of new immersive media platforms and tools promises to create the most drastic changes in how journalists record events and communicate with audiences. So, when McClatchy New Ventures Lab opened its doors in May of 2018, we set about building for that future. Our mission: to explore what’s next in immersive storytelling. First we recruited a team of journalists and technologists, unlike any group that had previously existed within the company. Next, with our teams in place, we began our first large-scale experiment. Our hypothesis: It’s feasible for small, multi-talented teams of journalists to quickly produce non-fiction AR stories* that will wow and engage audiences and bring them back for more. Our raison d’etre: Just by attempting to prove that hypothesis, we’ll learn valuable skills and lessons that we can apply to McClatchy’s core business for years to come. Understanding this emerging medium will allow us to: strengthen the visual journalism our newsrooms are capable of, harness new tools for data visualization and documentation, enhance existing products and create new ones, introduce new advertising and branded content opportunities for our sales teams to takeIndividual instance of a shot; a take = each time the camera is started and stopped. to market and provide expert guidance to our organization as the new landscape of immersive media unfurls. We feel lucky that we get to do this work, but we also know it’s vital to ensuring that local journalism is amplified on current and future platforms. …we’ve learned enough about volumetric production to fill a collegiate course. And we’ve created two groundbreaking AR series, about 40 minutes of original volumetric journalism. Produced by Cassandra Herrman and Nani Sahra Walker. “What They Carried” is based on the photography series “El Sueño Americano” (The American Dream) by Tom Kiefer. This three-episode AR experience features confiscated personal items from undocumented migrants who’d been apprehended trying to enter the US. Through the technical power of the Actual Reality application, audiences can place these intimate objects in their homes, examine them from every side and discover the hopes, fears and stories imbued in them by the migrants who carried them. The story also brings viewers face-to-face with three dimensional “volumetric” interviews with characters like “dreamer” Karina Ruiz. Finally, original commissioned artwork by Micah Milner adds an interpretive layer to the story, illustrating meaning, history and memory. Produced by Eric Howard and Stanley Okumura. The series explores the cuisine and culture of four ethnic enclaves around America: the prep, the chefs and the food’s history. Through the lens of the Actual Reality application, viewers order virtual take-out from these culinary treasures. By placing delicious 3D multi-course meals on their tables, viewers will find themselves inside kitchens, across from patrons and restaurant owners. They’ll even peer down into dollhouse-sized neighborhoods. Each course is packed with facts, stories and videos that give the audience a virtual foodie tour of the communities that the audience is invited to visit. Throughout the production process we’ve refined our storytelling with formal usability testing and guerrilla user research. Now it’s time to share what we’ve done with a larger audience, gather even more feedback (and bug reports), catch our breath and decide how we will push AR journalism even further. That’s why we’ve decided to publicly release Actual Reality, an Android app** to distribute these experiences to stakeholders like you. We’ll begin gathering data using a custom analytics suite and additional user research and probing that data to learn how users are experiencing this new form of storytelling. We’ll use that information to inform our roadmap and to shape our plans for our second cohort of Storytellers in Residence. Sign up here for a notification when we open our application process in the coming months. We also look forward to sharing our findings and some lessons and reflections about the tools we’re using. This summer or fall, we plan to convene an unconference about volumetric journalism. We’ll bring together a few dozen of the brightest folks doing nonfiction volumetric storytelling for a long weekend of collaborating, debating and photogrammetryThe use of photography to survey and map a location from a variety of angles. dancing. Immersive journalism has a long way to go, but we’re excited to keep exploring how we can use it to illuminate the issues that matter to our audiences, how we can use it to bring value to our advertisers and what our journalistic ethics and traditions can contribute to the birth of a new way of storytelling. ** Here is a list of the 239 android device models we’re supporting as of launch. We are discussing adding support for iOS’s ARKit and other immersive platforms in the future. Meanwhile, we think it’s most important for us now to learn what makes a wonderful volumetric story. If you’re interested to see what we’ve done but don’t have access to a capable device, email us at NewVenturesLab [at] mcclatchy [dot] com. We’ll be visiting newsrooms, partner organizations and immersive industry groups across the country over the next few months to put on live demos. We can also provide screen recordings or even loaner devices to select partners. *** We’ve discussed the idea of allowing others to distribute their volumetric content through our app. If you’re interested in exploring that with us, please get in touch. This article originally appeared on McClatchy New Ventures Lab’s Medium account and has been published here with their permission.. Follow McClatchy NVL on Medium for more insight on their use of emerging technology. As 'Lead Strategist' for McClatchy's New Ventures Lab, Ben guides an interdisciplinary team of technologists through experimentation and development of new projects that will ultimately benefit newsrooms across the country and help reach new audiences. His past endeavors include serving as an executive producer during the development of AJ+ in San Francisco, receiving a Knight grant to launch his own solutions journalism platform, producing and teaching 360° video for clients like Al Jazeera and The Washington Post, and helping launch Al Jazeera English's webby-winning interactive talk show "The Stream." He likes beer, bikes & Battlestar Galactica.